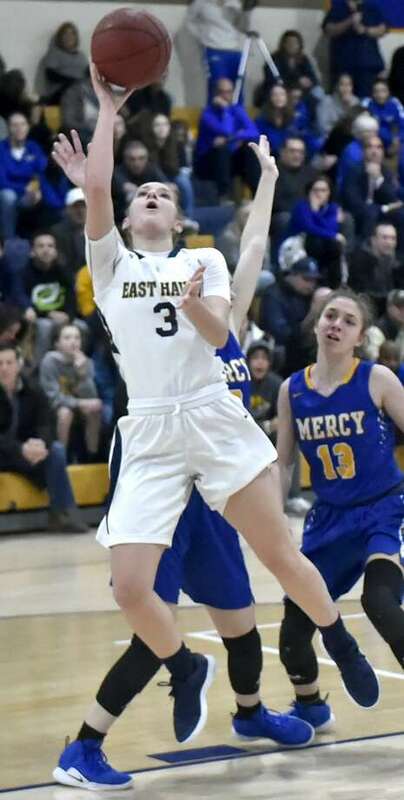 East Haven’s Makenzie Helms puts up a shot against Mercy on Monday at East Haven High. When East Haven’s Isabella Ragaini’s put back, game-winner at the buzzer of the 2018 Class M state final went through it was the end of a storybook season for the Yellow Jackets. The Yellow Jackets moved to Class L this season and are ready to write a new story. Chapter one is winning the SCC regular-season title and securing the No. 1 seed in the conference tournament. After that, is the Class L tournament, a step up from the Class M field East Haven navigated last season. No. 7 East Haven (16-4) has already been competing against some of the top L and LL schools in the state in the SCC as well as taking on New London and East Lyme out of conference. In Class L, No. 6 Windsor (19-1) and No. 3 Notre Dame-Fairfield (19-1) loom atop a pack of dangerous teams. One thing East Haven has on its side is experience. While Makenzie Helms is the lone senior starter, both juniors Ragaini and Alexis Pendziwater also started on the state championship team. The experience of having already played at Mohegan Sun is hard to replicate and Russell is hoping it helps his team. Friday night Westbrook defeated Hale Ray 49-17, winning their eighth game of the season, qualifying for the Class S tournament, dressed in alternate pink uniforms. More importantly, the team raised over $1,500 for cancer research as part of the team’s “Life is Much Larger Than a Basketball Court” campaign. Tara Laugeni of Amity scored her 1,000th career point as part of a game-high 20-point effort in a 60-24 win over Career. Senior Iyanna Lops of Trinity Catholic scored her 1,000th point as part of a 17-point performance against Danbury. Crosby junior Tiahna Pulliam scored her 1,000th point in a 52-46 win against rival Kennedy.